GameCore is CBSNews.com's video game column, written by William Vitka. Star Wars Galaxies is not the creature it used to be. "The game's been severely dumbed down," former Galaxies player Garrett Johnson told me. He played SWG from its inception until Sony Online Entertainment and LucasArts implemented the "New Game Enhancement," or NGE. "They moved from a profession-based system to a class-based system," Johnson explained. "Instead of balancing all the professions, they just reduced the number of combat classes and turned it into a rock/scissors/paper game." There is something to be said for evolution, which is how Sony Online Entertainment views the change to its massively multiplayer online role-playing game. It sees improvement. Many fans have yet to be convinced. In our last mailbag, we posted the complaints. Many are not just disappointed -- they are enraged. One e-mail in particular was a stick of dynamite. Written by an anonymous source, it claimed that Sony Online Entertainment had released unfinished software, and it went on to attack company president John Smedley for an alleged narrow focus on only one thing: exploiting the Star Wars license. "I'm bent about that one," Smedley admitted in a phone call. "As a person, I have zero problem with criticism. I don't have any problem whatsoever with our customers complaining. I think it's perfectly legitimate, and I think it's perfectly legitimate for you guys to have a mailbag with hate mail from Star Wars Galaxies. But of all the mail, that's the one that bothered me because it's filled with a bunch of BS." "There has never been a release by Sony Online Entertainment that has been incomplete," Smedley said. How do we define "incomplete?" A widespread problem, from the player side, is the number of bugs in the game. Smedley admits that Star Wars Galaxies has its share. A bug is a defect in the code of a program. That is a basic definition. I prefer Ben Silverman's translation: "a bug is the crap that was supposed to be fixed before they sold you the game and ruined your day." "For some reason or another, the gaming industry has grown used to the idea that a game can ship with some bugs and that this is somehow an excusable side effect of dealing with computer software," Silverman contends. If a CD doesn't play the last track, you go get your money back. If a DVD is missing a chapter, you go get your money back. If the display on your television doesn't work properly, you go get your money back. If a car company forgets -- I don't know, the seat belts, you go get your money back (assuming you were dumb enough to buy a car without seat belts in the first place). Moreover, if one particular company keeps releasing CDs or DVDs or TVs or cars with bugs in them, people start to avoid that company like the plague because they're releasing "incomplete" products. Of course, this is not only a problem with Sony Online Entertainment. It has infested the entire gaming industry. Despite a multitude of furious postings at the Star Wars Galaxies forums about the NGE, Smedley told me the postings are only a vocal minority. Most players, he said, are in the game. Now, I am strongly in favor of common sense, honesty and decency (which undoubtedly bars me from holding public office), but it's hard not to wonder whether Smedley's vocal minority contention is spin -- counter-clockwise to Richard Nixon's "silent majority." This is not to suggest in any way that Smedley is Nixonian, but there is the matter of logic and numbers. According to MMORPGChart.com, Star Wars Galaxies had approximately 250,000 subscribers in July 2005. Recently "hacked" numbers purporting to show how many active players were in the game potentially put current player numbers far below that. When I asked Smedley whether those statistics were authentic, leaked or not, it was hard to get a direct answer. "For years," he said, "we have not put up the numbers for competitive reasons." "Somebody hacked to get those statistics. They did it on the client side. Those [numbers] are not public information, nor is all the information there." The post, which has been duplicated on many sites, alleges that on a Friday evening, there were only 10,363 subscribers playing. These numbers never claimed to be a count of Galaxies subscriptions. They are merely an alleged snapshot of how many people were on the servers at a certain point in time. Smedley is more candid when he speaks generally, saying, "Have the numbers in Star Wars Galaxies gone down? I will tell you that the concurrent numbers have gone down. Are they as low as what was shown there? Absolutely not." By "concurrent numbers," Smedley is referring to how many people are online at once. Mark Wallace, a journalist and MMO blogger who maintains Walkering.com, ruminated on what the numbers could mean. "I'm not sure how 10,000 concurrent players compares to SWG's former levels, or to other games with a purported 250,000 subscribers. In part, it depends on how many shards there are. As a point of comparison, EVE Online, which has no sharding but just takes places in a single universe, has just over 100,000 subscribers. Yet it sees concurrency rates of 20,000 on a regular basis, which is fantastic." "Second Life, on the other hand, also has 100,000 subscribers, but sees concurrency rates of around 5,000 or less most of the time," Mark told me. "...it took a couple of days to touch base with the key members of the Galaxies team. Unfortunately, LucasArts has no comment for this story. I'll be sure to keep you informed with announcements for future Galaxies' plans and our upcoming titles." And then a review-copy of Star Wars: Empire At War arrived on my desk. Despite rumors that LucasArts imposed the changes, Smedley says the "Combat Upgrade" and "New Game Enhancements" were mutually agreed on. 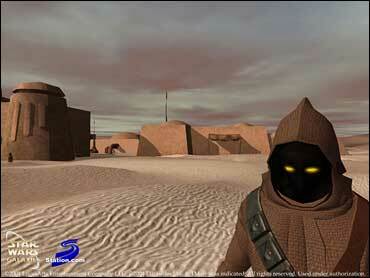 The decision to modify Star Wars Galaxies was made by both companies. "There's a reason that we did this. The story ... is kind of getting lost here...the game was losing subscribers. We had to make this game more accessible to a wider audience or eventually we would not have a business," he told me. Smedley is not an unsympathetic character. I've rarely -- if ever -- been able to speak so candidly with a major company's president as I did with Smedley. And to his credit, few other men in his position take it upon themselves to personally respond to players on their forums when serious accusations are made. One has to respect that. Smedley told me that focus groups drove the changes and what was best for the game. Those focus groups started after the decision was made to alter the game, and they originated at LucasArts, not SOE. LucasArts again declined to comment. "LEC [LucasArts Entertainment Company] handles the marketing for SWG (in the past, Sony Online Entertainment has served primarily in a developer capacity, something that's changed a bit in the last year), so they take the lead on activities like research. However, the surveys were developed jointly between the two companies," Chris Kramer, Director of Corporate Communications for SOE, told me via e-mail. Sony Online Entertainment never ran its own surveys for the NGE. Enter Jason Gould, who describes himself as an avid supporter of the original concept in which players were given the tools to create their own world. Gould is one of the administrators of SWG Refugees, a kind of user-created cafe for disenfranchised Galaxies players. He said he was "part of the original 'Combat Upgrade sandbox testers' who in the last months of 2004 and early months of 2005 were told we would be helping to test the new combat upgrade to come." "All information we were originally told was scrapped and a new system that nobody had asked for and which was obviously not in development for the last year was thrust on the game, which began the alienation of the non-combat players." To Sony Online Entertainment's credit, the most recent software patch, called "Publish 27," is considered to be a step in the right direction. It adds new content and fixes some of the previous bugs. There are, unfortunately, new bugs; but, the SWG development team seems to have started working on the problems in the game. The community has some proof that they are being heard. One poster said simply, "Thank you for Publish 27!" Another Publish is on the way. As it happens, each patch to the game that SOE releases seems to be something of a small step towards making Star Wars Galaxies similar to its pre-NGE state. SOE knows that they've dug themselves into a hole. They're trying to get out. But the question remains: Is it too little, too late? It is Gould who writes this possible epitaph in his own words: "SWG is a story rife with broken promise after broken promise, nothing was ever finished or polished, corporate greed and yearn for making current quarter profits pushed development, instead of meeting the real needs and wants of the players."